Following Bestial Burst releases sold out from here: (BeBu-029) EVIL ANGEL (FIN) - Unholy Fight For Metal CD, (BeBu-089) LOINEN (FIN) - Pekka cassette. No re-presses planned, so get them from distributors while they still have ´em. What's up with legion blotan? Copies of Thy Horrendous Yearning and Wisdom of the Few special box CDs still in stock due to unpaid orders. Email ekhidnarecords@gmail.com to order. Copies of the tape will be later available from Hell´s Headbangers and Legion Blotan as well. 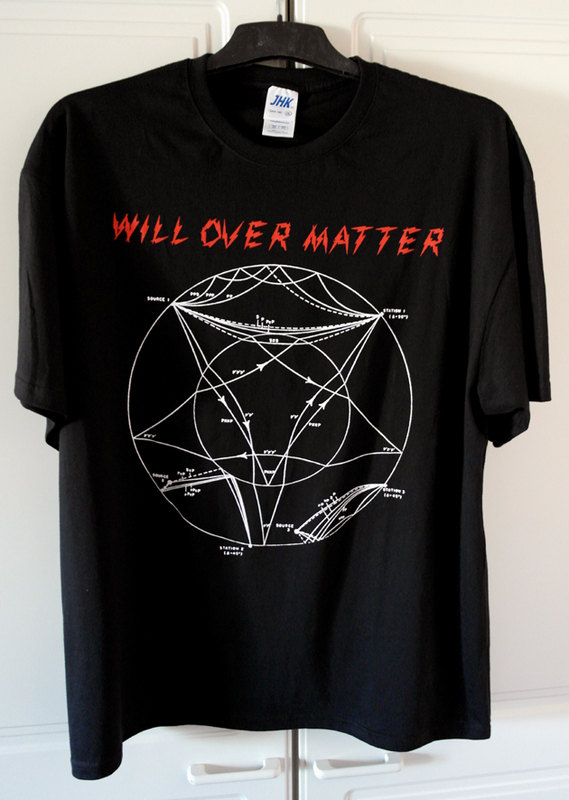 -First ever official Will Over Matter t-shirt! Black shirt with that "pentagram looking" white earthquake diagram from the Might of the Planet Eater album cover (also used as part of Phenomenal Highways album art), with band name in red ink and font used in Power Dances album cover. Great quality JHK brand shirt, that´s very close to Gildan in size and feel (and so a little bigger in size than European Fruit of the Loom shirts). The shirt in the photo is XXL, so you can see the print is big. All in all, it´s the ultimate WOM shirt! Only size XL available (men´s size). 15 euros + postage. Ordering that WOM shirt this week. The XXL size of the WOM shirt sold out already, but if someone needs one, drop me a line. Other sizes still available! M size of WOM shirt sold out too. But let me know if you need one, printing few more may be possible. Sizes S, L and XL still available! I would pick up a medium if you made some more. Charity Saints will be available from Iron Scourge soon. I'll stock copies in the US at Analog Worship. Looking for an XL RFR shirt, is there a new batch planned soon? Thanks!